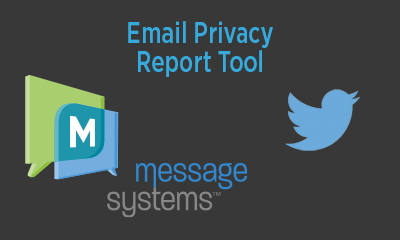 Message Systems joined forces with Twitter yesterday to announce the release of the Email Privacy Report, providing the public with visibility into whether their own email providers utilize verifiable security protocols to protect their users. Our hope is that the Email Privacy Report will encourage users and ISPs to open a dialogue supporting the use of STARTTLS text encryption protocols and the establishment of industry-wide standards, with an end-goal of safer email communication, improved business productivity and protection against the theft of personally identifying information. This collaborative effort leverages both Twitter’s position as one of the largest global social networks with a reach of hundreds of millions of people and Message Systems’ expertise in email infrastructure and delivery. The two companies worked hand in hand to expose the data, sort it, measure it, aggregate it and provide the most comprehensive Encryption of Email in Transit report currently available on the Internet. The report will be a permanently accessible tool on the Twitter website, easily tweeted out by users with the aim of widely distributing information that concerns every citizen on the Internet. Users are also encouraged to tweet about ISPs that provide excellent security – or those that need improvement.